The headlines this week were about Buster Posey’s season-ending injury during the Giants–Marlins game the other night. Because of Posey’s increasing stature in the league – he is one of the NL’s upcoming stars – his is an injury that has generated much discussion. Many people are advocating that baseball change the rules to prevent violent collisions such as occurred Tuesday night. I have no doubt that Bud Selig will give in to these voices of change and at some point – maybe next season – there will be a rule change. And then one of baseball’s most exciting plays – the play at the plate – will be as non-existent as waxed Coke cups with cellophane lids. In spite of its reputation as a non-contact sport, Baseball has always been a dangerous game. In the dead-ball era two players died after being beaned in the head by pitched balls and a player like Ty Cobb would routinely sharpen his spikes to intimidate the opposition when stealing a base. Although brushbuck pitches were a routine part of the game up until the 1980s batting helmets were not widely used until the 1960s and were not made mandatory until 1971. Yet even with the protection of a helmet there is probably nothing more fearful in sports than standing 60’ 6” away from a pitcher who is hurling a baseball 90 MPH at you – sometimes within inches of your head. In a sense, baseball is a lethal game on every play. But that is the beauty of baseball. It is a non-contact, finesse sport that requires a lot of guts. 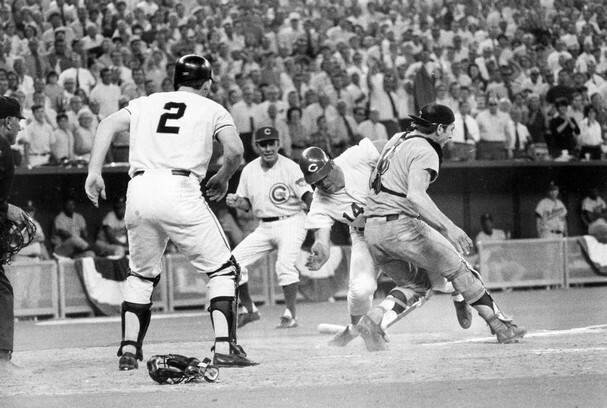 Participant in baseball’s most famous home plate collision – during the 1970 All-Star game in Cincinnati – Ray Fosse does not think the rules should be changed to protect the catcher. Asked to comment in the wake of the Posey injury, Fosse said that the sometimes violent confrontation between catcher and base-runner cannot be avoided and that tradition should be respected – even though his own promising career may have been shortened by his collision with Rose. I could not agree more. The image of Rose racing down the third-base line and barreling into Fosse to score the winning run in the bottom of the 12th inning is perhaps the most enduring and exciting moment in All-Star game history. So with the collision in San Francisco the other night. It is unfortunate that Posey was injured and will likely miss the remainder of the season. But it was exciting baseball.